German writer; born Nov. 10, 1848, at Mindszent, Hungary; brother of Alexander Kohut. For three years he attended the Jewish Theological Seminary in Breslau. He then studied philosophy, literature, and Oriental languages at the university in that city, and obtained his Ph.D. degree at Jena in 1877. Meanwhile he was active in journalistic work, becoming the editor successively of the "Berliner Zeitung," the "Breslauer Nachrichten," the "Düsseldorfer Zeitung," the "Schleswig-Holsteinische Tageblatt" (Kiel), the "Tribun" (Berlin), the "Orchester," the "Siegfried," and the "Kieler Nachrichten." In Düsseldorf and Dresden he was appointed musical and dramatic critic of the two leading dailies. He published a "History of the Dresdener Hoftheater" as well as a long series of biographical monographs, on Rossini, Meyerbeer, Auber, Rubinstein, Weber, and others. Several of the monographs were issued by the publishers Reclam of Leipsic, in their Universalbibliothek. In addition to these, he published many volumes on musical and dramatic criticism. He edited a volume of Weber's unpublished letters; wrote the standard biography of the poet Theodor Körner (now used as a text-book in many of the German high schools); issued several volumes of biography dealing with princes and statesmen, notably on Bismarck and Emperor William I.; and published several volumes of translations from the Hungarian, especially the works of the Hungarian national poet Alexander Petöfy. He published also critical editions of a number of German classics. While editor of the "Berliner Zeitung," his attitude toward Bismarck and the government was so aggressively antagonistic that on Sept. 13, 1884, he was expelled from Prussia, remaining in comparative obscurity in Dresden until his pardon was granted in 1889. Emperor Francis Joseph conferred upon him the Cross of Merit, with the Crown, for his services to Hungarian literature, and in 1892 made him Knight of the Order of Francis Joseph. Kohut was recently elected a member of the Academy of Sciences in Budapest, and for many years was president of the German-Hungarian Society in Berlin. 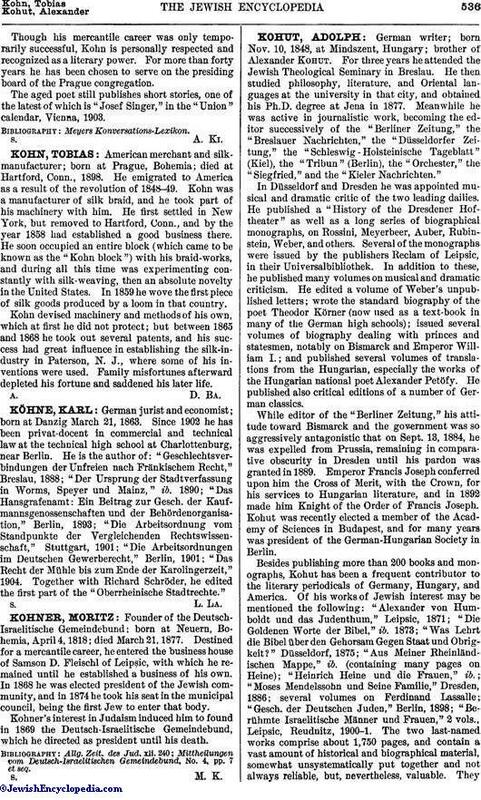 Besides publishing more than 200 books and monographs, Kohut has been a frequent contributor to the literary periodicals of Germany, Hungary, and America. 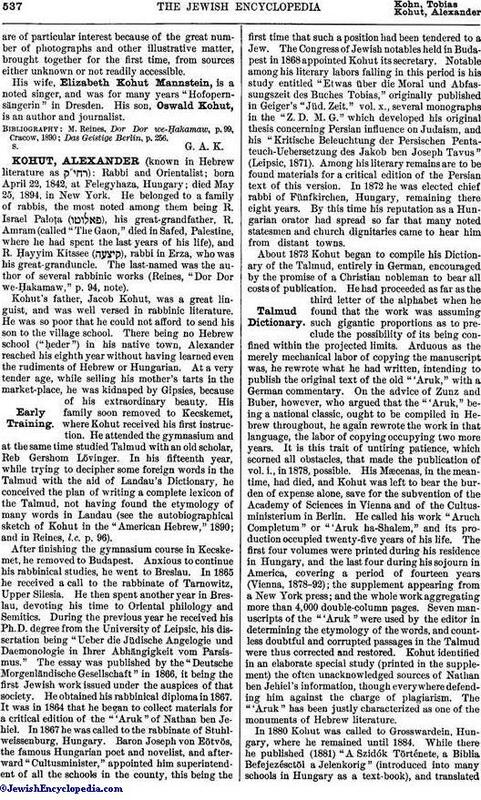 Of his works of Jewish interest may be mentioned the following: "Alexander von Humboldt und das Judenthum," Leipsic, 1871; "Die Goldenen Worte der Bibel," ib. 1873; "Was Lehrt die Bibel über den Gehorsam Gegen Staat und Obrigkeit?" Düsseldorf, 1875; "Aus Meiner Rheinländischen Mappe," ib. (containing many pages on Heine); "Heinrich Heine und die Frauen," ib. ; "Moses Mendelssohn und Seine Familie," Dresden, 1886; several volumes on Ferdinand Lassalle; "Gesch. der Deutschen Juden," Berlin, 1898; "Berühmte Israelitische Männer und Frauen," 2 vols., Leipsic, Reudnitz, 1900-1. The two last-named works comprise about 1,750 pages, and contain a vast amount of historical and biographical material, somewhat unsystematically put together and not always reliable, but, nevertheless, valuable. Theyare of particular interest because of the great number of photographs and other illustrative matter, brought together for the first time, from sources either unknown or not readily accessible. His wife, Elizabeth Kohut Mannstein, is a noted singer, and was for many years "Hofopernsängerin" in Dresden. His son, Oswald Kohut, is an author and journalist. Das Geistige Berlin, p. 256.